MetaMoJi’s mazec3 handwriting add-on for their award-winning apps Note Anytime and Share Anytime allows Android users to entirely bypass their keyboard and simply handwrite within any application. Since mazec3 offers an alternative input to the keyboard, users can also use the app to handwrite emails, posts to Facebook, tweets or any other number of activities on their mobile device. 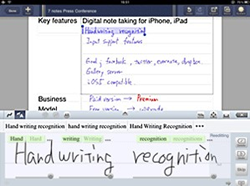 Users have reported back to MetaMoJi Corporation that the mazec3 handwriting app has made note taking easy in many apps on their device. Mazec3 works perfectly with Note Anytime or Share Anytime, but also with any other app on the device as an alternative input method to keyboard entry. As more and more daily activities are being conducted on mobile devices, users often complain about slow input with small online keyboards. To remedy this problem, MetaMoji created a powerful handwriting recognition application called mazec3 that combines fast character recognition, line curve correction and an intelligent predictive engine, thus making input as quick and easy as pen and paper. Users with poor handwriting or writing impairments of any kind, greatly appreciate the ease and speed the handwriting recognition provides. Since mazec3 offers an alternative input to the keyboard, users can also use the app to handwrite emails, posts to Facebook, tweets or any other number of activities on their mobile device. Users can look for anything within popular search engines, such as Google, Yahoo, and Bing by simply handwriting what they are looking for in the input section at the bottom of the screen. Instead of having to type every letter, users can simply handwrite one or more words and hit enter to display search results. When writing in rooms with poor lighting, users appreciate the ease and speed with which they can reply to an urgent email by handwriting their response instead of straining to see the keys to the online keyboard. With mazec3 for Android, users can quick add or edit appointments into any calendar application. Mobile users will love how quickly they can handwrite their posts in Facebook, Twitter and other popular social media platforms. mazec3’s powerful predictive text engine is extremely accurate in guessing popular words and phrases in each of the 13 languages it supports (each language is sold separately). The text engine comes preloaded with popular phraseology and technical terminology in each language, while also correcting spelling errors in real time. When the mazec3 engine is used in conjunction with Note Anytime and a calligraphy pen, the result is even smoother and more legible due to the advanced curve correction feature that instantly transforms partially formed letters into words and legible sentences. This corrective feature, combined with a powerful predictive engine, makes mazec3 an indispensable tool for people struggling with poor handwriting and physical disabilities. On Android, the mazec3 handwriting recognition engine is available as a separate app to add-on to Note Anytime and Share Anytime. Mazec3 can be purchased for $7.99 from the Google Play Store.